I need to sell ASAP due to family emergency, not pleased, but family first. 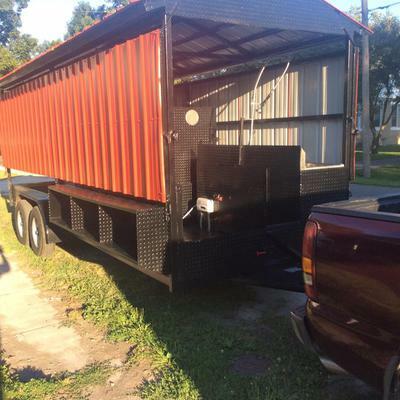 This a custom made Concession/Competition Trailer to my design. 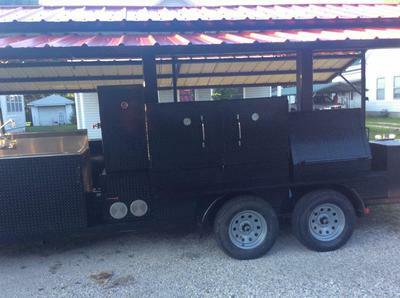 This trailer has never been used only one fire in it to season the smoker. $22,000 O.B.O. with in reason NO low ball offers. All heavy duty steel construction that is built to last. Paint is Rustoleum 1200 degree stove paint. 4' Awnings that fold down for travel. 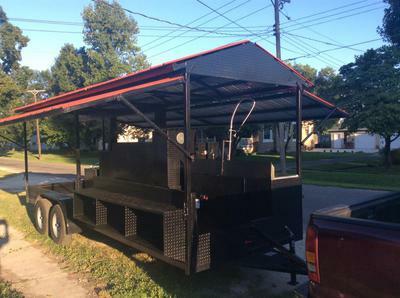 1 - 3' Charcoal Grill w/2 cooking racks 29"X36" and 18"X 36"
1 - 5' Double Door Reverse Flow Smoker with 3 racks 30"X 59"
1 - Firebox 18" x 24"
Smoker & Grill smoke stack tied together.